13 MON (13 Monocerotis). Sounds obscure doesn't it? A fourth magnitude (and at 4.50 on the verge of fifth) star with only a Flamsteed number to boast about in a constellation that nobody can actually recognize as such, Monoceros, the fabled Unicorn that stands to the east of Orion, which quite overwhelms it. But don't let that fool you, as it is quite the magnificent star, an unusual class A (A0) supergiant, albeit in the lesser-supergiant category. 13 Mon is at first, though, perhaps best known as something of a "gateway" star rather like Epsilon Mon, the two guiding the way to Monoceros's most famed entry in the stellar catalogues, the extraordinary Rosette Nebula, which lies two degrees east of Epsilon and a bit more than that to the south of 13. While a temperature of 9670 is well-determined, the distance (both needed for luminosity calculation) is not. Indeed the star is demonstrative of distance-difficulties. It's so far away that the parallax (the positional shift caused by the orbiting Earth) is unreliable. The original Hipparcos satellite parallax gave 1500 light years, while an improved re-working of the data now gives nearly 4000 (which is silly), with a consistent whopping estimated error. There are other ways to go about it though. 13 Mon is thought to be in the Mon OB 1 association of massive stars, and is related by birth to the cluster NGC 2264 (whose distance we know), which lies 3.5 degrees northeast of the star. We can also get an estimate from its spectral class, which gives an estimate of visual luminosity. The best value seems to be around 2800 light years (though with a hefty uncertainty). We do need an estimate of dimming by interstellar dust, but that's an easy one. In spite of the fact that the 13's light is scattered by local dust to make a surrounding "reflection nebula," there isn't any significant absorption. Thirteen Monocerotis shines brightly at the center of the picture. It's surrounded by a faint reflection nebula caused by starlight scattering off thin dust in the area that is visible mostly to the east of the star (to the left) and that extends at least 10 light years out. Such nebulae are common around hot blue stars in the Milky Way. National Geographic-Palomar Sky Survey, California Institute of Technology. 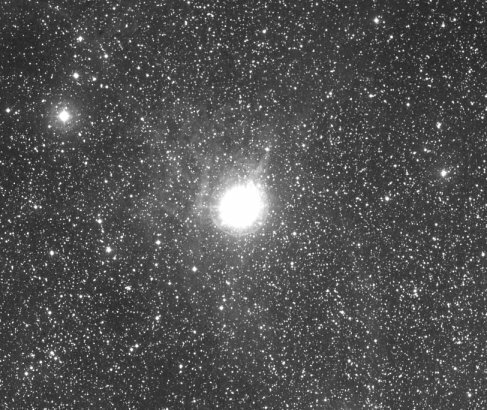 Instead, the star's in a nice clear path, which is rather odd for its line of sight in the Milky Way. All that said, we then get a luminosity of 10,800 times that of the Sun, not up to the class-A-supergiant-icon Deneb's value of 54,000, but certainly high enough. Luminosity and temperature conspire to give a radius 37 times that of the Sun. A projected equatorial rotation velocity of 18 kilometers per second then yields a rotation period of under 105 days. Theory shows that the star's mass hovers around 9 times solar and that it is slowly growing in size with a dead helium core. Starting life as a hot class B1 star, it gave up core hydrogen fusion just 60,000 years ago, and is on its way to becoming a vast red supergiant with a radius 10 or so times its current size. Like most supergiants, it's also a variable, though not by much, the star changing its brightness by a few percent with no discernable period. Blowing a 325-km/s wind from its surface, like all such stars, 13 Mon is losing mass at an estimated rate of about 10 billionths of a solar mass per year, hundreds of thousands of times greater than the flow of the solar wind. It's right on the point at which a star either loses most of its mass and creates a very massive white dwarf (near the allowed limit of 1.4 solar masses) or blows up as a grand supernova. Wonder which one it will be. We can only wait to find out. Written by Jim Kaler 3/12/10. Return to STARS.